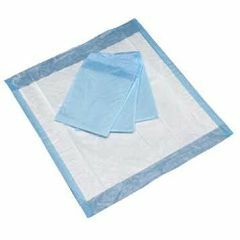 At Ease - Standard Absorbency Disposable Underpads - 23" x 36"
At Ease are manufactured with an extra soft facing to reduce the possibility of skin irritation and and designed to protect your bed linens, furniture, automobiles and more. At Ease incontinence products, manufactured with our patent pending integral knit technology, deliver exactly what the market demanded: exceptional strength, unprecedented chemical resistance, fluid containment and cost effectiveness. Use them for dogs cheaper. Wouldn't let a human use . Keep picked up when soiled ,keeps smell down,and wrap in plastic shopping bag! My wife is in a group home. I bought them at their request. I have had no complaints about them so I will assume that they are acceptable. End of comment. Product used to protect the bed and wheelchair to and from the shower. I have used another brand in the past with good results and purchased these because of reviews that highly recommended it for dogs. My dog was larger (60 lbs.) and wasn't trained to use these, but was old and needing to go more frequently and having accidents. These were too flimsy for her and bunched up, moved around when she tried to go, and pee ended up on floor under them creating a worse mess than without. I forget which brand I used previously (pink backing), and they were fine. I used these as puppy pads...they are too thin. I'll go back to a previous type used. I use both the 4x4 sponges and the under pad and have had only one order I was not satisfied with that was the under pad which was not made be TENA.